This month, I am the host of the chicken farm bakers' project, so I started thinking about what I want to try. I didn't make this kind of dessert for a long time (my friend call it a lot of things cake, haha). Anyway, I always love it. The cake that take a lot of time to make is not hard to do if you can manage your time. 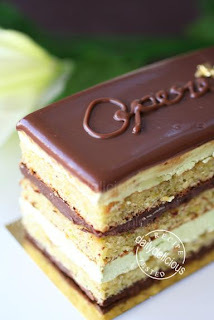 I decided to make the Opéra cake, but as the chicken farm bakers, we don't like to follow the rule, we love to create something that we want to try. 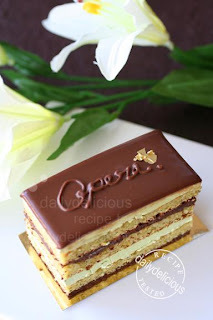 So, our Opéra cake is not the traditional one, we will make it with joconde cake, buttercream and ganache but with the flavor of our own choice. I choose the pistachio flavor, as I saw the recipe in the book a long time ago and really want to try it, but at that time I couldn't find the pistachio paste, so, as soon as I get it, well, I have to do it ^ ^. If you want to make this kind of cake, it's not hard to do, but as I say that the time management is the key. 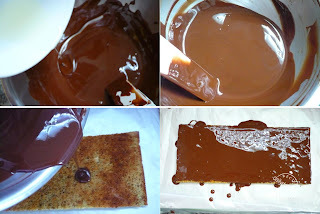 You can start by making the filling (all of them in one day, except the glazing ganahe because it will be easier to use it when it just cooling down, the top of the cake will be shine and smooth). Then bake the cake, and assemble it when you have time. 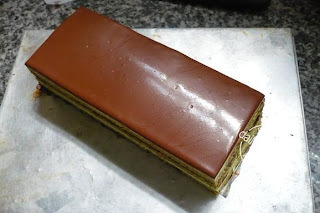 Or, as I did, I started by baking the cake one day, and next day make the filling (first I made the base chocolate, the buttercream and then filling ganache), I filling the cake and put it in the fridge when making the next filling. I love this cake, even I must say that it's not the most perfect cake. My friendts made a lot of comment and I accept it. So, the problem for my cake is I make double recipe of the filling ganache so this layer is too thick (in the recipe I already correct it, your cake will have a thin layer than mine), and the buttercream is too thick too (for my friend not for my family, haha). 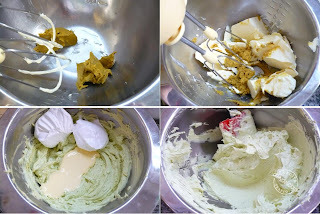 Because my sister love to eat buttercream so I use a lot of it, but if you are not like it so much, make only half the recipe of the buttercream and again, your cake won't be as tall as mine. And one more problem is don't forget to cover the cake completely because the fridge will make the cake drier. But I still love it, it make me feel good that I had a chance to do something that I really want ^ ^. So, if making some kind of this cake is your dream, don't be afraid to try it, and you will know that it's not as hard as you believe. *TPT is the mixture of nut and icing sugar in equal weight. 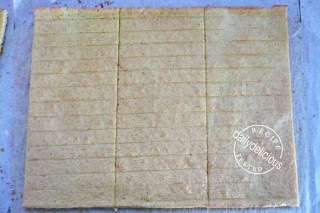 Preheat the oven to 200 °C line the pan with baking paper. If using the ground pistachio, just mix it together with the icing sugar to make the TPT. Or you can ground the pistachio with the icing sugar. 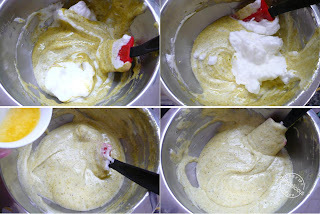 Mix the TPT, almond flour and egg together with the hand mixer until smooth, mix in the flour and set aside. Meanwhile, melt the butter, and set aside. Beat the egg whites and sugar until stiff peak form. Fold the meringue into the nut and egg mixture until fully combine. Fold the warm melted butter into the mixture. Pour the mixture into the prepared baking pan and bake for 8-15 minutes. When cool cut into 3 pieces. Put the whipping cream into the pan and boil over low heat. 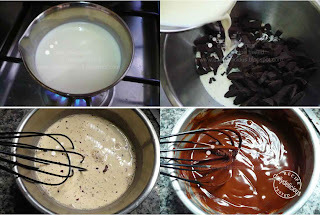 Pour the hot cream over the chocolate and stir until the chocolate melt. Put the butter and the invert sugar into the ganache and stir until combine. 2. When the syrup temperature reaches 110 °C beat the egg yolks until pale. The Italian meringue and the pate a bombe. Beat the Pistachio paste until soften, add the butter and beat to combine. Put the 30g of Italian meringue and 40g of ใPate a bombe into the butter mixture and beat to combine. Note: if the color is too pale add some green food coloring. Melt the chocolate, then add the oil, stir to combine. Place one sheet of cake wrong side up , pour the chocolate mixture over and put the cake into the fridge until harden. Before assembling the cake make the simple syrup by putting the water and sugar into a small pan and boil over medium heat until the sugar dissolve then let it cool. When the chocolate on the base is harden, flip the cake right side up and sprinkle with syrup. Spread the buttercream over the cake, then place another sheet of cake and sprinkle with the syrup. Put the cake into the fridge until the buttercream harden. 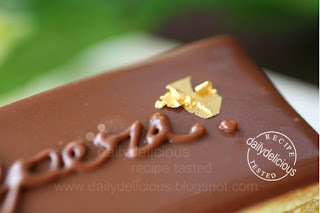 Spread the filling ganache over the cake, then place another sheet of cake and sprinkle with the syrup. Put the cake into the fridge until the ganache harden. Spread the buttercream over the cake, then put the cake into the fridge until the buttercream harden. Bring the cream to boiling point in a small saucepan. Remove form the heat, pour into the chocolate, allow to stand for 1 minute, then stir until smooth. Pour the ganache over the buttercream, then put the cake into the fridge until the ganache set (it won't harden). Cut the side of the cake, then cut into pieces. 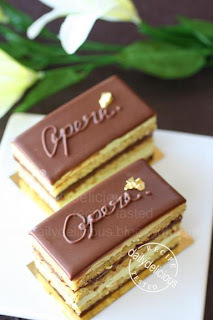 Decorate with the ganache, then serve. a picture perfect cake as always. Follow your blog for sometime. Your creation always amaze me. 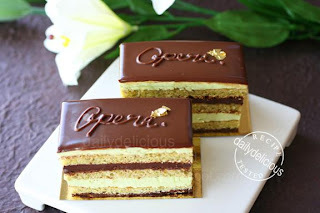 Your Opera Cake really beautiful. Your creation always simple yet elegant. Your step by step illustration pictures very useful to a beginner like me. Thanks a lot. Thank you, I hope you try this recipe too ^ ^. Thank you, and I'm happy that you like my step by step illustration pictures. Please try it, you will have a lot of fun. is TPT 125 gr for the pistachio paste? If i want to use ground pistachio , how much is the sugar and how many gram is the pistachio shell ? 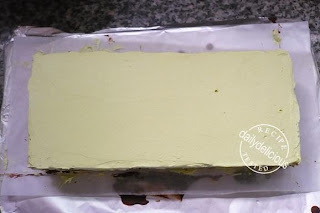 TPT* (pistachio)......... 125g is 62.5g ground pistachio and 62.5g Icing sugar.